Hello and Happy Hump Day! What a week it's been so far for me.. work week that is. I've been working a lot of hours over the last month or so and this old gal is getting tired! lol I've told myself that I'm retiring in 4 years.. I hope I haven't been fooling myself. I really need more crafting time! 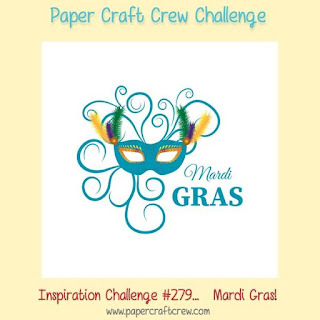 This week over at Paper Craft Crew we have an Inspiration Challenge. What do you think of when you see this Challenge Graphic?? So when I saw the Challenge Graphic, the first thing I thought of was Feathers.. but I didn't really have a current feather stamp and didn't want to pull out something retired. One of my new resolutions is to try my best to use current product! As I was looking through some of my stamp sets I realized that the Peacock would work perfectly for this one! I learned so many things while making this card.. lol First of all, I realized that if I had stamped the Peacock higher I could have had it standing on the "celebrate" die cut.. that would have been awesome. Also, I realized that since I didn't stamp it that way and since I wanted to sponge the bottom, I should have sponged prior to embossing the bottom portion because the Smoky Slate ink really did make the gold embossing a little dull. I tried to wipe it with a paper towel to remove the ink sitting on the embossed part but it didn't really do a great job. So .. you have the awesome opportunity to learn from my mistakes. Below is a list of the items used. Both the Beautiful Peacock and Celebrate you Thinlit Dies are Free Sale-a-bration Items that you can earn with a purchase!